We have received an overwhelming response to our program, receiving roughly 500 individual packages of crayons each week. The good news is that a lot of people are sending in their crayons. But the bad news is that our limited staffing makes it almost impossible to keep up with individualized logging of weights. It’s been a heavy lift. To improve the efficiency of our operations, we’ve decided to move to a different weighing system. Going forward, we will no longer be individually weighing each donor’s package. Instead, we are logging all shipments as a whole. 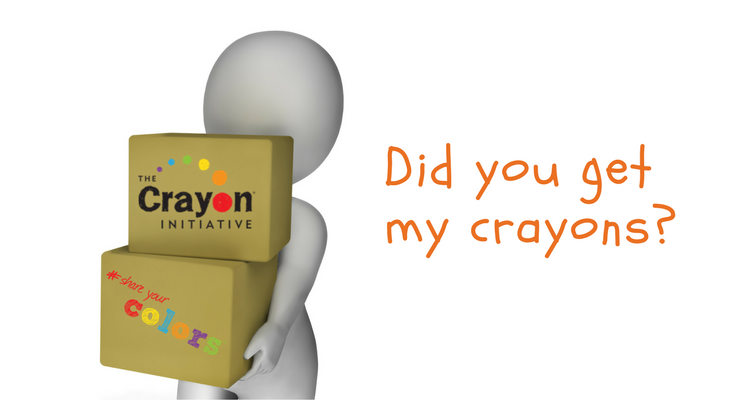 To keep you informed on our collection status, The Crayon Initiative will send out a monthly report stating the total weight of crayons received the past month and year to date, as well as other metrics. This shift in structure enables us to weigh several packages at one time, thus allowing our team of volunteers to get back to sorting and making new crayons for kids facing tough times. Thank you for your understanding as to why we’ve had to develop a more sustainable model for processing the crayons we receive. If you would like confirmation your crayons have been received, please follow our UPS shipping instructions, check the box for “Delivery Notification” and you will receive an email as soon as UPS delivers your crayons to our doorstep.